Any one who has ever lived with a newborn knows that the first few weeks of round-the-clock feedings are mind-numbingly exhausting for new parents. The Koo, a new transformer bassinet/rocking chair and late-night feeding system, hopes to make the new parent burden a little easier by smoothing out the edges on the late-night feeding routine, by providing everything a new mom (or dad) needs all in one convenient package. We spotted the Koo at the International Contemporary Furniture Fair this past week, and we could see all the moms in the vicinity fawning over this multitasking superhero of baby furniture.. Built by Lunar, the Koo is a bassinet that turns into a rocker and back again, a genius maneuver that not only eases baby’s transition from feeding to sleeping, but also minimizes both the product’s carbon footprint and its physical one. Simply put, babies are stuff magnets. Even the most spartan of home decorators would have to cry uncle once the stork made its drop, which explains our unremitting love for furniture that pulls double or even triple duty. Designed for bleary-eyed new parents who have to contend with many a late-night noshing, the Koo unfolds from a bassinet to a feeding rocker with one hand. Better yet is the auto-rocker embedded into its base—a boon for sleep-deprived Moms and Dads. Lunar has plans to develop Koo as part of a larger, holistic “feeding system,” with a tree stand that works as a mobile, baby monitor, and sound-activated thermoelectric bottle warmer/cooler in one. Also in the works: An electroluminescent fabric pillow/parent monitor that lights up as it transmits the baby’s cries to the sleeping adult. The pillow not only works as a nightlight during feeding, but it’s also a comfy support for the parent. Check out the video below for a peek into the future. I don't know about this one. I certainly appreciate the innovation, but it's a bit spartan even by modern standards and there's something kind of odd about sitting where you then place a sleeping baby. Kind of like sitting on their pillow before bed. You know what I'm saying. http://www.wearegoodkin.com/article/technology Check out the comments on this site about this product. LOL!!! Any one who has ever lived with a newborn knows that the first few weeks of round-the-clock feedings are mind-numbingly exhausting for new parents. �The�Koo, a new transformer bassinet/rocking chair and late-night�feeding system, hopes to make the new parent burden a little easier by smoothing out the edges on the late-night feeding routine, by providing everything a new mom (or dad) needs all in one convenient package. 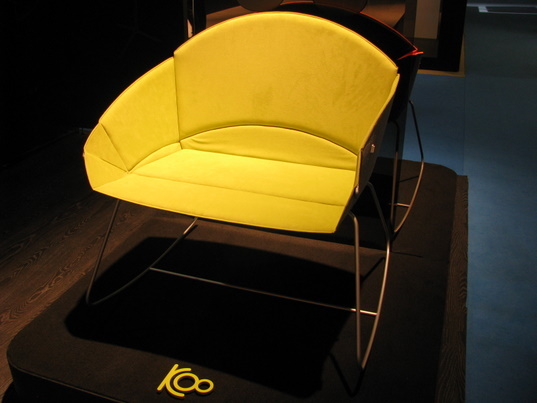 � We spotted the�Koo at the�International Contemporary Furniture Fair this past week, and we could see all the moms in the vicinity fawning over this multitasking superhero of baby furniture.. Built by�Lunar, the Koo is a bassinet that turns into a rocker and back again, a genius maneuver that not only eases baby's transition from feeding to sleeping, but also minimizes both the product's carbon footprint and its physical one.